Serving the Virginia, Maryland and Washington DC region and the entire United States since 1955, Shapiro Tax Consultant is your one stop, tax preparation and full service tax solution. If you are tired of fly by night services or large and impersonal accounting firms and tax service franchises, then we are the company for you. Our tax preparation services can be completed, by appointment, in person at any one of our three convenient locations located in either Woodbridge or Annandale, Virginia or for Maryland residents, at our Sykesville location. Additionally, you may mail, email, fax or drop off your information for swift service too! We also offer a full range of tax resources right here on our website, including our quick and easy Tax Organizer Forms along with Government Links for additional forms and the latest tax information. 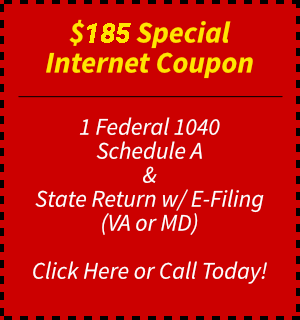 Contact Shapiro Tax Consultant Today & Save! Call (703) 978-3296 today or Contact Us Online for quick answers to your questions, to schedule an appointment or for additional information on emailing, mailing or faxing your information.